In the event you look twenty years back, the most prominent method for building brands and reaching out to your clients was by means of mobile phones, outdoor, and multi-media marketing. Today, the overall customer scenario has "digitally" changed and practically there is no limitation to the ways by which the target customers can be reached. These opportunities are tossing different challenges for brands and enterprises, and one of the prominent ones is to ensure Omni Channel experience for customers. Customers tend to experience the product and like or dislike the product/service by viewing it across various devices and digital platforms. Now, the challenge is to ensure that this experience is uniform regardless of the dimension or configuration or the network under which the device is operating. Ensuring Omni Channel experience is not just important, however, indispensable for the business. This has brought about an additional emphasis on Omni Channel Experience Testing. Testing Tools and Testing platforms are being utilized to ensure that the application under development delivers a consistent experience to the customers. Also, there is a lot of focus on speed and faster turnaround with regards to application development and testing. Speed can be achieved only when testing frameworks and automation is put in place. Customers today are exploited by decisions that are endless in the actual sense of the word. Devices with various versions of operating systems are making it even more difficult for businesses over the globe. 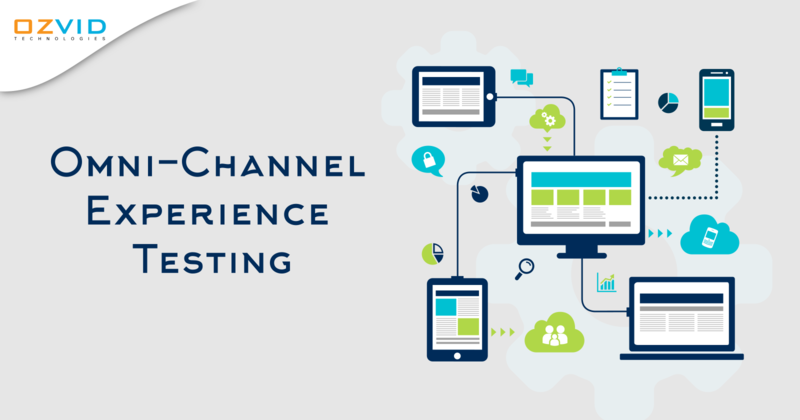 Numerous such compelling reasons are making Omni Channel Testing crucial for enterprises. Let's look at ways by which testing and development teams are making it feasible for businesses to ensure a flawless experience for their end customers. According to a Gartner article titled 'Top Six Security and Risk Management Trends', "Customer data is the lifeblood of ever-expanding digital business services. Incidents like the recent Cambridge Analytica scandal or the Equifax breach illustrate the extreme business risks inherent in handling this data. Moreover, the regulatory and legal environment is getting even more complex, with Europe’s GDPR the latest example. At the same time, the potential penalties for failing to protect data properly have increased exponentially." Worldwide enterprises are confronting tremendous cybersecurity threats resulting in the major focus on Security Testing. In an Omni Channel situation, this safe interface has to be ensured across all platforms. Here solutions focusing on security aspects such as Privacy, Integrity, Credibility, and Availability are required. Devices with multiple dimensions and configurations is one of the core reasons for working towards delivering a consistent experience. Hence, Compatibility Testing is implemented to ensure consistent experience in the overall Omni channel testing system. These tests are organized to focus on the mobile device and mobile OS fragmentation. Compatibility Testing, being a kind of non-functional software testing assesses the application's performance across over Operating Systems, browsers, mobile devices, and network conditions. This will eventually reduce the chances of system failure. An application is generally welcomed by the customers only when it is always available, dependable, and its performance is validated across various devices. Performance Testing is a quintessential aspect in the process of Omni Channel experience testing. It focuses mainly on the performance aspects that confirm the application's consistency irrespective of the environmental pressures on it. This is another kind of non-functional assessment of your application across the digital spectrum. For consistent experience, it is essential to test the application for its availability across diverse systems and dimensions. This is at the core of each application development process that helps to enhance the overall experience for the users and evaluates whether the application can convey the expected experience. In the last decade, how the internet is being leveraged has experienced a major shift with the advent of smartphones and tablet computers. This shift has caused a "Big Transformation" in the eCommerce industry as it has dramatically changed consumer behavior and moved them far from transacting traditionally. Shoppers anticipate that eCommerce platforms to be smarter, quicker, and secure. They additionally anticipate that the transaction experience to be advantageous, practical, and safe. Multi-channel commerce comprising of mCommerce and Social-Commerce is also catching the equivalent attention of the consumers fueled by enterprises' "Mobile First" strategy. To address the above challenges and deliver a value-added service, OZVID Technologies use proven strategies, techniques, processes, guidelines, and an apparatus and technology agnostic framework to ensure compelling and effective testing and validation of eCommerce platforms alongside its interfaces.